I’m back on the war path again – beating the drum of peace! I think “Peace” an essential part of any school’s curriculum, even an essential part of an EFL/ESL textbook. Look around the world today and you can’t reach any other conclusion. I’m relaunching Project Peace as a classroom on EFL Classroom 2.0. Consider joining our Peace Train and making your own Project Peace video to share this year. I’ve made it easy – just download a peace pack song and get started. Here’s some inspiration – what other teachers have done. I’ll be getting my new student teachers this year to participate (see some previous ones in the collection). 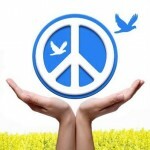 Let’s give peace a chance!